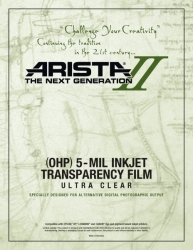 Arista II OHP Ultra Clear 5-mil Transparency Film is a polyester substrate coated with inkjet emulsion that can accept dye or pigment ink. It delivers crisp text and brilliant colors. Great for creating overhead transparencies, creating screens for screen printing and recommended by Freestyle for alternative digital output methods like alcohol gel (Purell) transfers. Each sheet has a notch cut in the upper right hand side. Holding the media in this direction insures that you insert it into your printer emulsion side up. 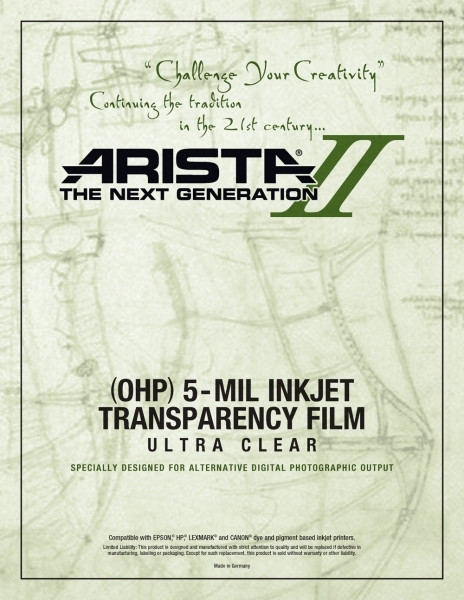 For jobs that require more image density, like digital negatives for Platinum and Palladium Printing, Freestyle recommends our classic, 7-mil, Arista II OHP Transparency Film. It has a heavier base and a waterproof emulsion.